I started playing cricket in the streets near my home with my brothers and friends. No one in my close family had ever played cricket at any formal level so I suppose the interest in the game was purely from within myself. I was also lucky that I had a lot of support from my family and they never discouraged me from pursuing my dream of becoming a cricketer. I did carry on my education and completed O’ Levels at Karachi High School as I feel that education is also important for any cricketer. I joined the Karachi Port Trust Academy at the end of 2014 and had my first taste of hard-ball cricket. This was a difficult time for me as I wouldn’t get enough opportunities to bat and then I was also asked to bat in the lower middle-order which wasn’t something I wanted for myself. However, any opportunity to play cricket was good, so I didn’t complain about it. 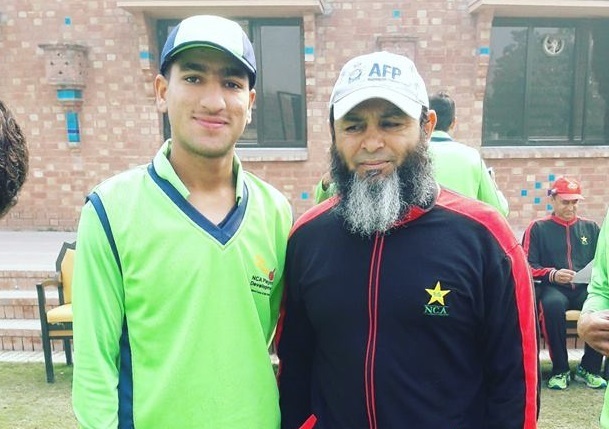 I was a little unlucky that I could not get into Under-16 cricket as at that time I was busy with my exams, but I got my chance to play in Under-17 cricket when I went for a trial and I was selected and shortlisted to play for a side. I showed my talent by becoming the highest scorer in the tournament in which I scored almost 500 runs which included a few centuries. I then moved up to District Under-19 level cricket in 2016 and then moved to Under-19 Region level cricket. In the One-Day tournament, I finished as the third-highest run-scorer with 325 runs in 7 innings including 4 fifties. This resulted in my inclusion in a high-performance camp at the NCA for Under-19s but sadly, I was not selected for the Under-19 World Cup in Bangladesh that year which was very disappointing. But all was not lost, and I played at the Under-19 level again and scored almost 1200 runs in 2017 in the Inter Region U-19 One-Day and Three-Day tournaments, including 5 hundreds and 4 fifties. This time, I was picked for the ACC Under-19 Asia Cup which was held in Malaysia in 2017. My performances in that tournament were nothing special but the experience I gained was very useful. Due to my performances in 2017, last year I was recommended for trials at Karachi Whites to play first-class cricket for the first time. This was a huge opportunity for me and a big jump in terms of quality of cricket from the Under-19 level. But I did not disappoint my team as in my debut game against ZTBL, I scored 135 runs and my century helped my side to an innings victory in that game. I have to admit that I was very nervous, but I was given a lot of encouragement by my team mates, my confidence grew as the innings progressed, and I was able to get to a memorable hundred. I was very happy that at the end of the Quaid-e-Azam Trophy in 2018/19, I had scored 582 runs in 8 matches which included 2 big hundreds. To play alongside some top-class players such as Khurram Manzoor, Mohammad Sami and Anwar Ali was an honour and also a great experience. I had hopes to play in the Pakistan Super League as I was the top scorer with 142 runs in 4 innings but unfortunately nothing came of it as I was not picked for the Karachi Kings squad which was very disappointing. Amongst the Pakistan batsmen, I really like watching and look to emulate the likes of Shoaib Malik and Babar Azam. Obviously when one talks about non-Pakistan players then Virat Kohli, Kane Williamson, Joe Root, Martin Guptill and Hashim Amla are all big names in international cricket and all of them are my favourites too. As an opener, I love to play cut shots and like to drive the fast-bowlers but for spinners my preferred method of attack is to come down the wicket as that gets me the most runs. I have always prided myself on the ability to play long innings and even though I have a good record in the shorter formats of the game, I would like to play Test cricket for my country. I learnt my cricket in Pakistan and it will be a great honour for me to serve my country by playing for the national team.